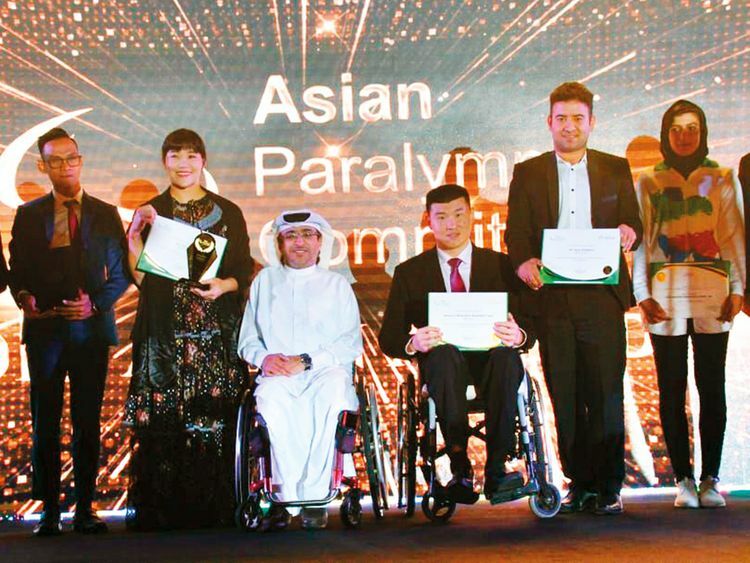 Dubai: Yu Chee Yui of Hong Kong and Mohammad Ridzuan of Malaysia were named the best para-athletes of Asia at a glittering 2019 Asian Paralympic Committee (APC) Awards Night held at the InterContinental Festival City late on Tuesday. Yu Chee Yui was awarded the ‘Best Female Athlete’, while Ridzuan walked away with the ‘Best Male Athlete’. Joining the winners in the presence of APC President Majid Rashid Abdullah Al Usaimi and UAE National Paralympic Committee (UAE NPC) President Mohammad Fadhel Al Hameli, was Hagar Safarzadeh Ghaderijani of Iran (Best Youth Athlete), the Chinese Women’s Wheelchair Basketball (Best Team Performance), Yukio Seki of Japan (Exemplary Asian Official) and Reza Joshghani from Iran (Best Photography). Dr Tetsou Suyama of Japan and Martin Chun Ying Lam of Hong Kong were bestowed with the Asian Order. “I have been to Dubai many times and every time, it’s been a surprise,” Yu Chee told Gulf News. “2018 has been a really wonderful year as I won five medals at the Jakarta Asian Para Games while also being the flag-bearer for Hong Kong at the opening ceremony. I believe this award will bring me luck for the rest of 2019 as today is the first day of the Chinese New Year,” she added. Yu Chee was detected with bone cancer when she was 10 years old. This ultimately led to the amputation of her left leg. But she battled all odds and is one of the biggest achievers for Hong Kong in wheelchair fencing. She was a sensation at the 2004 Athens Paralympics winning four gold medals in both individual and team events in épée and foil. She went on to add more medals in 2008 Beijing, 2012 London and 2016 Rio to take her collection to eleven Paralympic medals including seven gold. At the 2018 Indonesia Asian Para Games, she clinched five medals including a gold in women’s individual foil. “The qualification has already started for 2020 Tokyo and I believe with the luck and my hard work, I can qualify and win more medals in Japan next year,” she confided. Asian Order: Dr. Tetsou Suyama (Japan); Martin Chun Ying Lam (Hong Kong).